Zac posen just recently launched a line at Target and I have to say I wasnt really impressed. I LOVE Zac Posen, not only is he an amazing designer but he is terribly handsome. I went home with many pieces & even bought a dress for my sister. She looked so cute in the jean dress with the oversized pockets! I however only had luck with one dress and a cute tank top. I have to return the rest, womp womp. Anyway, this dress is PERFECT for a versatile woman like myself, you can wear it 3 ways! It’s the Day/Night dress! If I don’t want to come home and change for a night out all I have to do is add the tulle skirt! Its brilliant, and GENIUS. I also love this tank, reminds me of the New York Dolls. 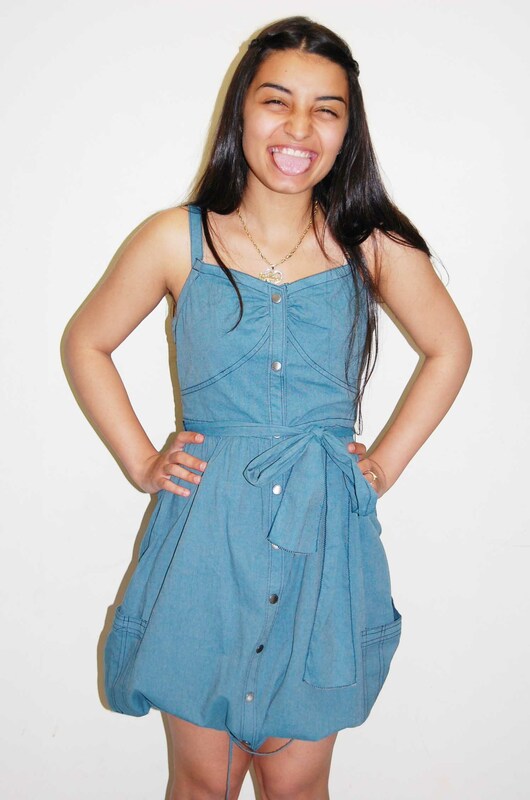 I bought this blue jean dress for my sister from the collection. She looks so pretty in it! ← Miss Ruth’s Time Bomb & The Sweet’s Shop! I absolutely LOVE the tulle skirt! love that dress! would you say it runs true to size, big or small? and who are your shoes by? Your entire family’s so stylish! Love it! I love the dress your sis is wearing. Easy spring to summer transition. Oh, and that hat you scored at Mode Merr complements the 3 way dress! Cute! I bought that dress too and the red and black lipstick tee. I felt the line was a little better than past designers. Can’t wait to see who’s next on the lineup! youre gorgeous first off 🙂 secondly that dress is super cute love the tulle skirt and that denim dress your sister is wearing is cute too! great post! Was in target Junction today and saw it. Sooo didn’t know the bottom part comes off NEATO!!! U rocked it out. But the section was sooo small. It was just that dress there really. Where do u target shop?